The twelfth UK BI reunion was held at the Grand Harbour Hotel, Southampton (pictured). 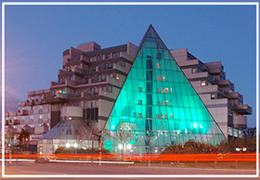 The hotel is centrally located, overlooking Southampton Water by the entrance to what we used to call the 'new' docks. With the end of Sue Spence's ministrations over many excellent events, comes the reckoning! 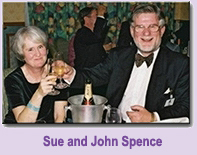 Sue writes: "Now that we have finalised the BI Reunion account and no longer have to carry any remaining balance forward for deposits for future reunions we have been able to donate the surplus to charities with seagoing connections". Well done Sue and Jihn for running things so efficiently that there was a surplus of this amount which could go to support these worthy causes. This page shows a summary of the final programme arrangements, as well as links to the guest list as it stood just before the reunion, and two PDFs containing full details of every event of the reunion weekend. Plans are being made to include a celebration of the Diamond Jubilee of Uganda's January 1952 launch. As usual the BI flag will fly from the hotel's flagpole and flags or other memorabilia will be welcome to decorate the function room. Those who were at Runnymede in 2008 will remember that Nevasa's bell and a brass plate from her engine room were displayed. In Newcastle it was Sirdhana's bell, brought along by Sandy Bowman, that summoned us to dinner while David Mitchell did the honours at the curry lunch by ringing Rajula's bell. Similar exhibits in Southampton would be splendid, so let Sue Spence know if you have anything you'd like to bring along. There will be the usual notice boards for anyone wishing to post information. The organisers have teamed up with Seb Rees (son of John Rees of BI), and his Travel Services agency, who has been negotiating with the hotel, has secured a discount on rooms for BI guests, and will be handling all accommodation arrangements. Bookings should be made on the TS booking form which needs to be printed and returned to TS. Should anyone wish to make their own arrangements there are several hotels nearby. 1830 for 1930 Reception followed by Reunion Dinner in the Mayflower Suite. Dress: lounge suit/smart casual. £38 per head. After dinner, a short presentation by Odyssey Marine Exploration and the team that discovered the shipwrecks of Gairsoppa and Mantola. 1300-1500 A two-hour harbour and river cruise on Blue Funnel’s Ocean Scene. This catamaran is stable in all weathers, has covered upper and lower decks, two large sun decks, bars and is heated throughout. Return coach transport will be provided between the Grand Harbour Hotel to Ocean Village. £8 pp inc transport, based on a minimum 100 bookings. 1800-2100 Talk by Simon Rees on BI's educational cruises, followed by a film show and buffet, in the Bradford, Standish & Winslow Suite. An informal get-together at the hotel for a screening of six films featuring BI ships. Rooms are being held at the Grand Harbour Hotel, Southampton SO15 1AG spanning pre and post reunion nights. The organisers, Sue and John Spence, encourage everyone to stay at the hotel as key parts of the weekend are based there, however other hotels are available nearby. Discounted rates have been negotiated with the Grand Harbour: a straight £100 per room per night for bed and full breakfast. Car parking is an additional £5 per day. To take advantage of this rate book with reunion travel agent Travel Services by July 20. 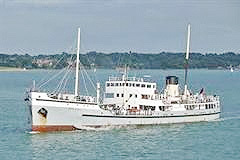 A heritage ship, included in the British National Historic Fleet and generally recognised to be the largest working steamship of her type in Britain. Built by Lobnitz & Co of Renfrew, she was launched in 1955. In 1976 after 21 years of faithful service on the Clyde operating as a sludge vessel she was purchased in 1977 by Southern Water and operated until 1985 when she was withdrawn from service. Shieldhall returned from Falmouth in May 2011 having spent a week in dry dock for planned survey work and maintenance. Problems identified with corrosion of the hull frames in the engineroom mean that she will not be sailing in 2011. However, she will be ready to resume service in April 2012. Visits to the engineroom and bridge are encouraged. Disabled access: please note steep shore/ship gangway, high sills, and steep companionways on board. A preservation society was formed in 1988 which operates as a charity and all restoration work is carried out by unpaid volunteers. The ship is based at berth 29 off European Way, via Dock Gate 4 and is normally open for visits on a Saturday, as that is one of their main workdays; any other visits by prior arrangement, between 1000 and 1600. Visitors are asked to make donations of at least £2.50. Further information including directions. This will be the twelfth reunion that John and I have organised in the UK and it will also, I'm afraid, be our last. When a small group of friends from Nevasa got together way back in 1989 and decided to meet up again in 1990, we spread the word among those from BI with whom we had kept in touch, little realising what we'd started. To our utter surprise, 120 people responded enthusiastically and gathered at the Lyndhurst Park Hotel for a wonderful reunion. Since then we have visited Stratford-on-Avon (1992), Botley (1994), Fareham (1996 & 1998), York (2000), Bristol (2002), Portsmouth (2004), Glasgow (2006), Runnymede (2008) and Newcastle (2010). Numbers increased with each reunion, peaking in 2006 in Glasgow for the 150th BI Anniversary Reunion. While numbers are still healthy, inevitably the passage of time means that they will continue to decline and I feel this is the right time for us to stand down. It's been a great pleasure and a privilege, not to mention hugely enjoyable, to have played a part in keeping the BI flag flying and to have made so many friends within the BI community. It therefore seems fitting that Southampton, BI's home port, should be our final fling. Unless anyone out there has other ideas!